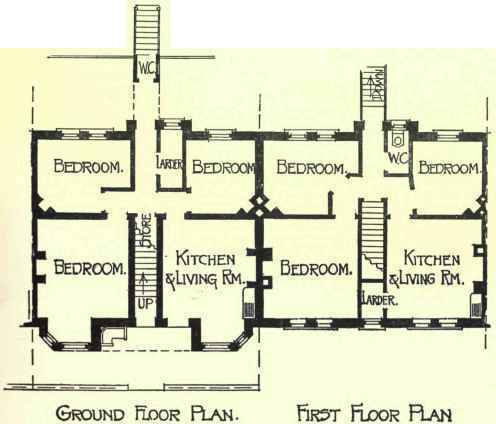 The difficulty of providing satisfactory houses for the working classes in large cities, where the value of ground is considerable, at a rental within the workman's means, has led to the development of a distinct class of buildings, or one may say two distinct classes of buildings, which may be called "workmen's dwellings" and "workmen's flats." Of these the "dwellings" are based on the principle of crowding as many inhabitants upon a given space as possible, in barrack-like structures of great height and extreme simplicity, built in long straight rows with wide passages between them. Such is illustrated in Fig. 14. It will be seen at once that the cost of construction is considerable, as, owing to the great height of the building, the walls have to be extremely thick, and consequently a great deal of money has to be spent upon brickwork. The blocks are divided up at regular intervals by party walls, and between the party walls two suites of apartments, if they can be so called, are arranged on each floor, served by a common staircase open to the front and protected only by an iron grating. In the particular example illustrated the level of the ground was considerably lower than that of the street, and consequently it was necessary to go down stairs from the street to the ground floor, the front windows of which had their sills almost level with the pavement. On this floor a passage passes through to a yard at the back, which is open for common use by all the inhabitants of the dwellings. In this passage the dust discharges, being received from a shoot from all the floors, and is caught by a large receptacle. One cannot help thinking that it would be much better if small dustbins were used, one to each set of apartments, for this could in no case be a very savoury arrangement. The accommodation is extremely limited. On the ground floor each habitation consists of two rooms only, together with a separate w.c, and with the addition of a small larder in one case underneath the stairs. There is no possibility of introducing a copper, and the sink is placed in the kitchen. On the upper floors one of the dwellings consists of three rooms and the other of two, except on the top floor, where each consist of a single room only, half the space being given up to an open drying yard or flat of concrete. There is no attempt at comfort in planning, and every other consideration has to give way to providing as many residences on the site as possible, in order to secure the maximum of rental; and it is astonishing what high rents these little dwellings produce. They lead, of course, to overcrowding and all its attendant evils, while the life of anyone who is condemned to spend the whole day in one of the upper floors of dwellings such as this must be dreary in the extreme. Fortunately, in spite of the high rents charged, it has been impossible to make workmen's dwellings of this kind produce a sufficient return for the capital invested, and they are now very rarely built. A much better plan is that of providing two- or at most three-storey flats in accessible suburbs with a small garden at both back and front for each flat if possible. In the suburbs selected the ground is moderately cheap, so that its cost does not weigh so largely in the financial scheme as to render these buildings unprofitable. In Plate I. will be found an illustration of a series of such flats which it was proposed a few years since to erect on a hilly site overlooking Southampton Water. Most of the houses, namely, Nos. 3-41, were planned as shown on the left-hand side. The ground and first floors were alike, the upper one being reached by an external staircase, and each residence consisted of three rooms sufficiently large for moderate comfort. The sink was placed outside the kitchen, and just beneath a small window, this being the best thing that can be done where there is no separate scullery. There are bay windows to the front, and the kitchen opens at the back into a small yard or garden. Every residence has its own separate entrance in the form of a small hall, so devised as to waste but little space. The first floor residences have their back garden or yards reached by a bridge, this being rendered possible by the slope of the ground. 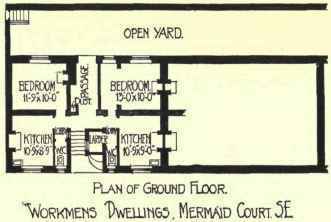 Of course, these residences are exceedingly small, and there is not so much bedroom accommodation as one would like. 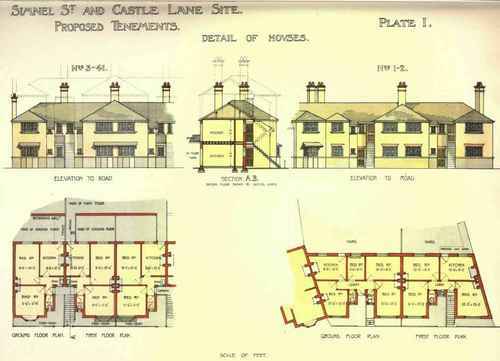 It is generally advised that no family residence should contain less than three bedrooms, but there are many circumstances under which fewer rooms will suffice, and these comparatively low-rented flats for the working class are necessarily devised with extreme economy. With that end in view the chimneys have been kept together, and the result has been rather advantageous than otherwise to the rooms, which are rectangular. At one portion of the site there was an awkward piece of ground, and advantage of this was taken to provide rather larger residences (Nos. 1 and 2), the corner house having three bedrooms on each floor, and the other one having four, with the sinks in recesses as before, and thus out of the way of direct passage from room to room, and well lighted. 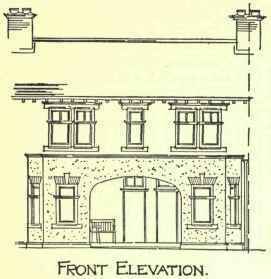 The elevation has been kept as simple as possible, but by the use of rough-cast a sufficiently pleasing effect has been obtained to render the tenements homelike in appearance, and to give an external impression of comfort, which is itself by no means a small thing. Fig. 15 illustrates a scheme by which the staircase to the upper floor is kept under cover. The entrances to both ground and first-floor houses occur under a sheltered porch, and the living room of the ground-floor house is entered directly from the exterior. This is a comparatively large room with a cosy bay window, and would be a comfortable room to live in, although it contains the sink. Out of this a cross lobby is reached which serves three bedrooms, two of which have corner fireplaces and are small. These are placed at the back, while the third room is comparatively large, with a bay window similar to that of the kitchen. There is a small store under the stairs, which would serve for fuel, and a separate larder is provided beside the passage to the back yard or garden. The first-floor residence is as nearly similar as is possible, the larder now being obtained as a cupboard out of the kitchen. Over the bottom portion of the staircase there is a second staircase of iron leading down from the back door of the first-floor residence to the garden behind that belonging to the lower flat, and the space beneath it is utilised for the w.c. to the lower flat. 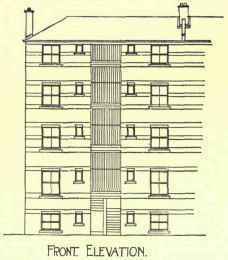 The only objection which can well be raised to these flats is that they occupy a good deal of frontage, otherwise they provide sufficient accommodation for a family of moderate size under the conditions usually found amongst the working classes. It will be noticed that no copper is shown on any of these plans. If washing has to be done at home it would have to take place in the kitchen, which is also the general living room, and this would be exceedingly uncomfortable. It is generally thought better in flats of this sort to force the inhabitants to do their washing at a public wash-house, as tending to greater comfort in the home; and as both the dwellings and the wash-houses are usually built by the municipality rather than by private enterprise, there is no objection to this course.